I am planning to do a series of very large Potomac river landscapes, so am trying some some different compositions. Last weekend we went for a hike along the Potomac. I took a bunch of photos of some rocky land jutting out into the river. There are a lot of interesting compositions to explore for some larger paintings. Here’s a pencil study of one I’m considering. A pot catching a glint of sunlight in my front yard. Cobalt blue, nickel azo yellow, viridian, transparent pyrrol orange, and magenta. The shadows are viridian, cobalt blue, and magenta. The highlights are some white gouache. I am slowly learning my way around gouache, sticking with ultramarine, burnt sienna, yellow ochre, and white. The cup on the left reminded me how out of practice I am drawing. 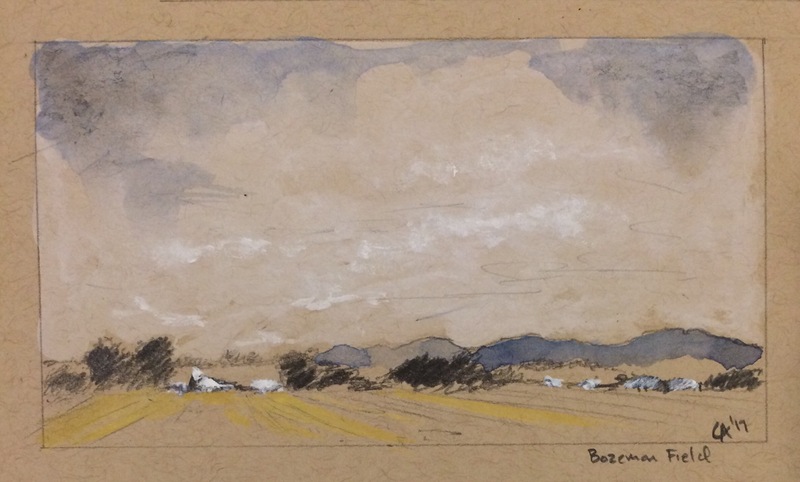 I like the little landscape, though, of another field in Montana, especially the yellow ochre fields against a cloudy sky. Testing out some strathmore toned mixed media paper with a 3×5 sketch. Pencil, indigo, yellow ochre and titanium white watercolor. Though the paper is very thick, it buckles a little of it gets too wet. Good for this type of sketching with watercolor I think, and likely better with white gouache.